The North Carolina Digital Heritage Center has added another new partner, the Brevard Music Center. Materials from the Center that are now available online include photographs that date back to the Center’s origins as a music camp at Davidson College and every issue of Overture, the program for the camp and festival that has occurred every year since 1945. Brevard Music Center was started by James Christian Pfohl as Davidson Music School for Boys in 1936. 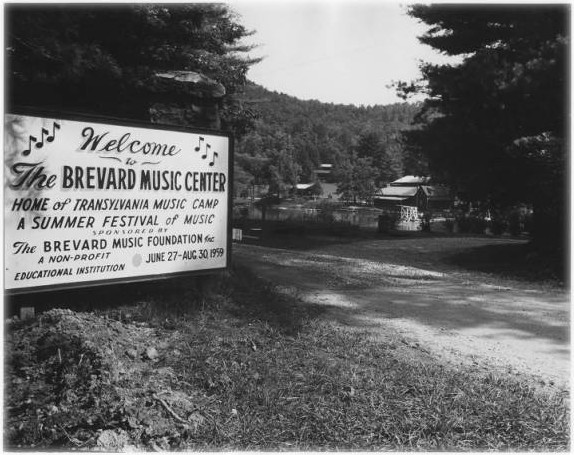 The school moved to it’s present location in Brevard in 1944 and became coeducational and named the Transylvania Music Camp. 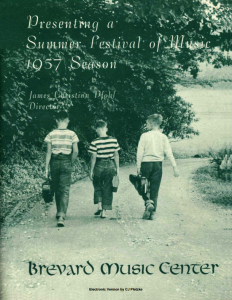 In 1946, a music festival was added along to the summer camp and in 1955 the school and festival became the Brevard Music Center. Over the years has trained hundreds of students in music, from playing instruments to singing. Many big names have played at the Center, including Midori Ito and its’ current artistic director, Keith Lockhart. The NCDHC is excited to add such an important part of North Carolina’s music education history to DigitalNC for a wide audience to enjoy. 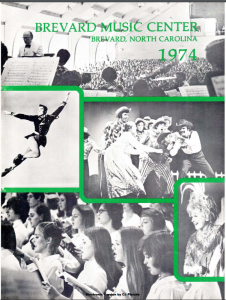 To learn more about the Brevard Music Center and view the resources that have been digitized, visit their contributor page here.